SCOTTY BOWMAN STANLEY CUP photo picture photography for sale. DETROIT RED WINGS STANLEY CUP CHAMPIONS 2002 PHOTO PICTURE WITH SCOTTY BOWMAN photo. 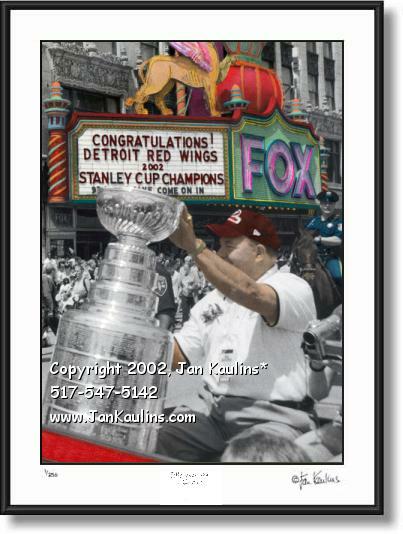 DETROIT, MICHIGAN Red Womgs Stanley Cup Victory Parade 2002 Scotty Bowman photo picture art print : This Detroit Woodward Ave. 2002 Stanley Cup victory parade picture, a photograph of Detroit Red Wings Coach Scotty Bowman with The Stanley cup, was made from an original black and white photograph that was photographed and hand-colored by nationally recognized photographer and artist Jan Kaulins.